The lunar lander was equipped with scrubbers designed to clean the air for 2 men for 2 days…not 3 men for 4 days. 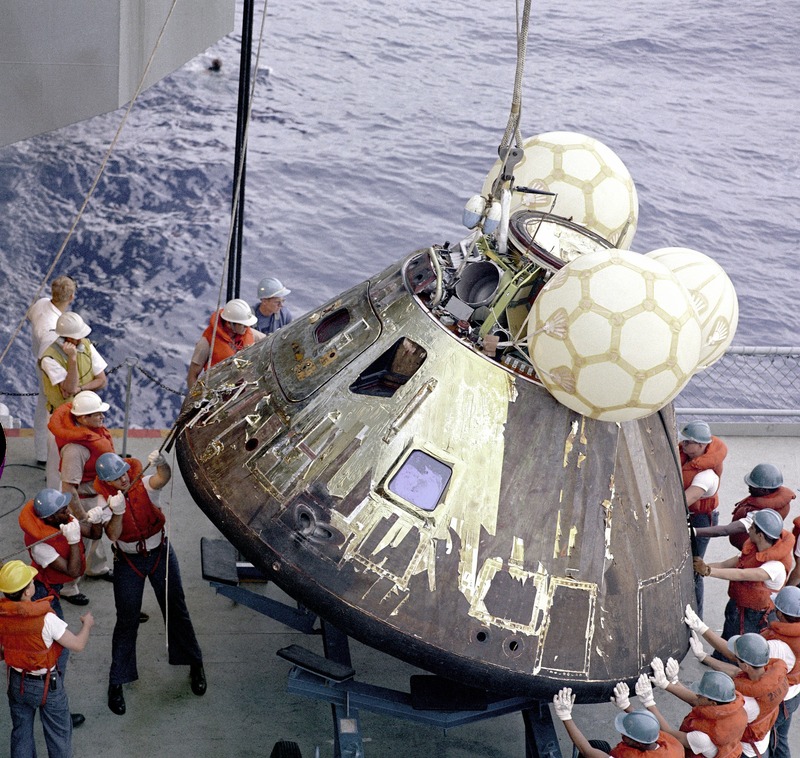 And if something wasn’t done soon, the constantly increasing CO2 in the landing module would poison their air and they would die long before reaching home. Now one might think: Why didn’t they just change the filters on the scrubbers? Well they would have, except they didn’t have any that shape. The scrubber filter in the lander was round – and the spare filters they had were square. They would literally have to fit a square peg into a round hole. and they survived because they asked for help from mission control. The Apostle James was executed, Peter was jailed, Philip was stoned to death, And a great number of believers were arrested, beaten and sometimes killed for their faith. And as it grew – it bore fruit all over the place. It literally turned the world upside down. But how was it that the church not only survived – but thrived in such a hostile atmosphere? Well, the church was able to do what they did because from the very beginning they were trained in the basics. It was a few simple things that trained them – and gave them their “Staying Power.” So, what did they do to train themselves to be a strong church? Acts 2:42 says; “…they devoted themselves to the apostles’ teaching – and the fellowship – to the breaking of bread – and the prayers.” These were the four activities that gave the early church their endurance and strength. Now, our faith should be an adventure. It should be exciting to know we’ve been part of something that really matters. It should be exciting to know that God can use us to turn the world upside down. Of course, we still live in a world that’s not real excited about that idea – a world that is literally hostile to God and His Kingdom. Faced with this reality, then, we need to realize how critical these four basic things are to us as believers. Why? Because the written words of Scripture are the ONLY place that we will come to find the will of God – it is the only place where we can learn anything about Jesus – and it is the only source for understanding how we are to live our lives to please God. And it is so sad that some congregations and church bodies have walked away from the written Word. They have bent to social pressures and built a social theology that does not coincide with biblical teaching. Now, it is true that not everything in the bible is black and white. And for those things we have to be tolerant of others’ points of view. An example would be baptism. When is it appropriate to baptize a person? Well, it is one of those grey areas. We know we are to baptize, but nothing in the bible insists that it must be done when the person is an infant. Nor does it state that we must wait until the person can truly believe what is going on. At any rate, this is why it is so important that our children be in Sunday school and that we be in bible study. In fact, did you notice how often the Bereans studied the Bible? Every day! One can not get enough of God’s Word into their heart and mind. We live in a hostile world and we need the assurance the Bible can supply. OK, so the second thing was fellowship. And going to church is the act of going to be with other Christians. We can do it in a church building, or in someone’s house, or in a park, or even out in the middle of a corn field. Why, because we are the church! And anywhere we gather is where the church is. And I am tempted to say that fellowship is at the heart of what being a church is all about. But I can’t. The heart of being a church is worship. Without worship we are nothing more than a club. Having said that I must also admit that fellowship lies at the heart of what makes a church a church. Why is that? Because we live in a world that is hostile to God and His Kingdom. We need Fellowship – we need each other. Ecclesiastes 4:12 puts it this way: “And though a man might prevail against one who is alone, two will withstand him – a threefold cord is not quickly broken.” In other words, we gather to find strength in each other, to uphold one another as we face the hostile environment. One should expect that if they are part of a congregation that when they have trouble with their marriage that the group of believers would give sound advice. Or perhaps if we were out of work that the believers would help us find a job or get food and assistance in other ways. If we are in the hospital or lost a loved one – wouldn’t we expect the church to pray with us and cry with us? Of course we would. Unfortunately, that’s not the way it always happens. Why? Because the church is made up of sinful people. Look at the person next to you. No, not your spouse, the other person. They make mistakes, they fail, they fall short. Me too. And just because we ought to step up, doesn’t mean we always do. The good news is: you are the church and you are the church and you are the church. And if nobody else steps up, we can. Each of us can create fellowship. Each of us can step up and help, pray, and listen. Because that’s what this adventure is all about. We need to have the attitude that says: I don’t care if someone didn’t do it for me – I am the church and I can do it. The next item is the breaking of bread. Sadly enough, there are church bodies and congregations that don’t seem to think Communion is very important. I’ve heard of churches that don’t take communion during the church service because it interferes with the “flow of worship.” I’ve also heard of churches where Communion isn’t offered on Sunday morning because non-Christians and visitors might be offended by it. But Acts 20:7 informs us that “On the first day of the week, when we were gathered together to break bread, Paul talked with them…” Why were they gathered together? To break bread! They had come together as a church to partake of the Lord’s Supper. Paul just happened to be there and he taught as well, but the main reason they had gotten together was to break bread. Communion was the center of their worship. And why do we suppose this is true? Because this was why they were a church. The Apostles were powerful teachers, but the Apostles didn’t die for them. The church was a place of safety and strength, but church didn’t die for them. If it weren’t for this table, and what it meant to them, the early church would have crumbled and fallen apart. Because the cup and bread were constant reminders that Jesus died for them. It reminded them they didn’t deserve to be there. But God so loved the world… He so loved you and I… that He gave His only begotten Son that whosoever should believe in Him should not perish but have everlasting life. It’s because of Jesus’ love. It is because He allowed His body to be broken and His blood to be shed. It’s because He paid the ultimate price. That’s what this table is all about. And it’s because of this “meal” that the early Christians stood strong when faced with persecution and death. Lastly we come to prayers. Do you remember when Apollo 13 had their explosion? What was the first thing they did? They called Houston and reported the problem. They could have tried to fix the problem on their own. They could have said “We don’t need to bother Mission Control” – we can handle this. But if they had – they’d have died. They couldn’t handle that on their own. They needed a power from outside of their little world to reach in and help them. That’s what prayer is for us. It’s a realization that we as Christians need a power from outside to help. There’s a story in the book of Acts that illustrates this. The Sanhedrin had arrested Peter and John for preaching about Jesus. They told them if they continued to do so they would face their wrath. Now, I have to admit that if I had been Peter or John, the moment they freed me, I’d be right out on the street the next day and I would have dared them to stop me!!! I cannot begin to tell you how many times I have acted without praying. And that also means that I cannot tell you the number of times I have failed or fallen short in my life. Unfortunately, I am guessing that I am in good company on this point. I am guessing that none of us prays enough – that all too often we don’t even think about taking it to the Lord – and the list of excuses for not doing it probably extends into infinity. At any rate, God has called us to a great adventure. But it is an adventure that we need to train for. And we can never pray enough. Without those four basic elements we might as well be chaff that is blown in the wind. And this is why God took the time to spell them out for us – so that we would come to know how valuable they were. You know, I get endless mailings and email pushes about how to make this congregation better. There are thousands and thousands of programs that will help us to be better disciples or better prayer warriors. There are tons and tons of plans on how to reach the unchurched. But are any of them wiser than the church of the 1st century? Most of the stuff comes from congregations that think they are bigger and badder than the early church, and consequently they have the wisdom to improve on the things of God. But whether we are fifty people, five-hundred people, or five-thousand people – nothing we can think of will compare to the wisdom of God. We need to remember – that the only significant wisdom in this world comes from God. And if our adventure is ever to be successful – it is His wisdom that we must follow. Being present for this sermon was a much-needed treat for me. Sent me on my way with ideas and comfort. It has always been my belief that church is for sinners--but learned that is not the case, but rather a place outside my world where everyone present steps up. And, for the life of me, could not remember the bible cites and too embarrassed to ask what they were. Yet, here they are--proof that God works in mysterious ways.